By the time he was 16, Maung Zaw Oo had been forcibly recruited into Burma’s national army not once, but twice. First recruited at age 14 in 2004, he escaped, only to be recruited again the following year. He learned that the corporal who recruited him had received 20,000 kyat,1 a sack of rice, and a big tin of cooking oil in exchange for the new recruit. “The corporal sold me,” he said. The battalion that “bought” him then delivered him to a recruitment center for an even higher sum—50,000 kyat. In Burma, boys like Maung Zaw Oo have become a commodity, literally bought and sold by military recruiters who are desperate to meet recruitment quotas imposed by their superiors. Declining morale in the army, high desertion rates, and a shortage of willing volunteers have created such high demand for new recruits that many boys, some as young as ten, are targeted in massive recruitment drives and forced to become soldiers in Burma’s national army, the Tatmadaw Kyi. 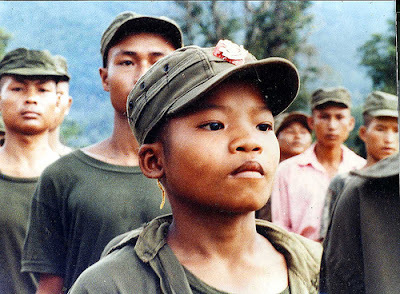 For over a decade, consistent reports from the United Nations (UN) and independent sources have documented widespread recruitment and use of children as soldiers in Burma.3 At the beginning of 2004 the ruling military junta, the State Peace and Development Council (SPDC), responded to international criticism of its child recruitment practices by establishing a high-level Committee for Prevention of Military Recruitment of Underage Children. However, close scrutiny reveals that the Committee has taken no significant action to redress the issue. Instead, the Committee’s primary role appears to be to denounce accounts of child recruitment as false. The UN secretary-general has identified Burma’s armed forces as a consistent violator of international standards prohibiting the recruitment and use of child soldiers, listing the Tatmadaw Kyi in four consecutive reports since 2003. Several armed opposition groups have also been listed for recruiting and using child soldiers. The UN Security Council has stated repeatedly that it will consider targeted sanctions, including embargoes of arms and other military assistance, against parties on the secretary-general’s list that refuse to end their use of children as soldiers, but so far has taken no action in the case of Burma. Given the abysmal record of the SPDC and some non-state armed groups in this regard, such action is clearly warranted.